Our Living Lab presented in July 2018 at Greentown Labs in Boston! 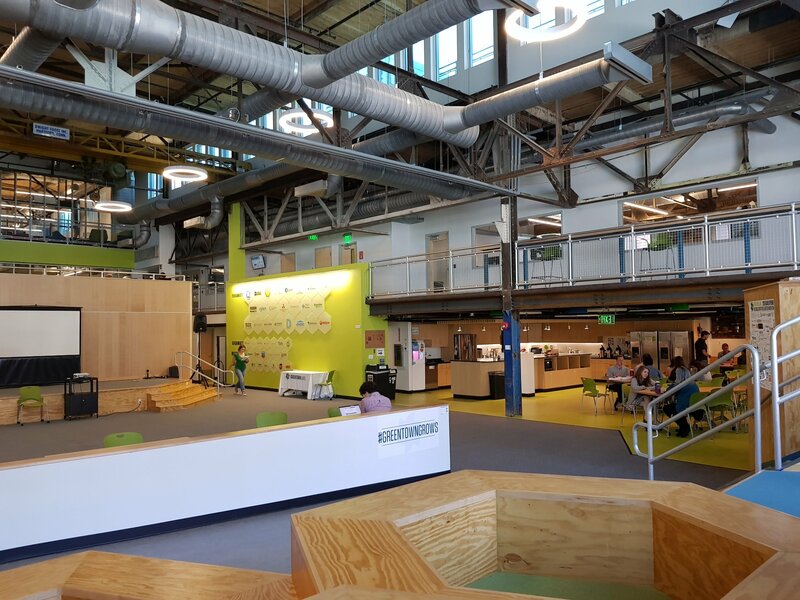 Greentown Labs is the largest cleantech startup incubator in the U.S.; Powered by a community of entrepreneurs tackling the world’s biggest energy & environmental challenges. Th!nk E went to Boston to exchange ideas with the Greentown Labs campus in Boston. The campus hosts several (mainly high-tech) start-ups that develop relevant technologies in the sector of green energy and sustainability. Located in Boston, the campus connects to many different universities there, such as Tufts University, MIT – Massachusetts Institute of Technology, Harvard and Cambridge. A guided tour around the building introduced the Th!nk E team in interesting technologies such as a electricity to hydrogen fuel station (Simple Fuel). Th!nk E presented the Living Lab and the extension to the Street Lab level. Preview here how hydrogen refueling is a little different than refueling a gasoline vehicle, but actually it isn’t complicated. There’s a pump and a nozzle, with a keypad and an info screen. These modern hydrogen stations are a lot like your average gasoline station, with a few innovative perks. An in-car fuel finder app can help you find the nearest station and the hydrogen dispensers actually communicate with the vehicle to help ensure optimal filling. Greentown Labs recognizes cleantech and clean energy innovations are happening across sectors—not just in hardware and software!—but also in water, advanced materials, and green chemistry. That’s why we developed a 1,800 sq. ft. shared wet lab to support cleantech startups working in this space. The functionality of the wet lab is a BSL-1. facilitating connections and collaboration opportunities between startups and corporations.